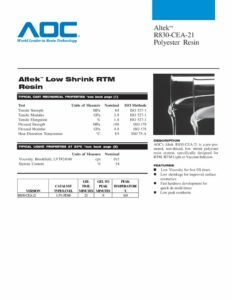 AOC’s Altek R830-CEA-21 is a pre-promoted, non-thixed, low shrink polyester resin system, specifically designed for RTM, RTM Light or Vaccum Infusion. A. Keep full strength catalyst levels between 1.0% – 2.0% of the total resin weight. B. Maintaining shop temperatures between 65°F/ 18°C and 90°F/32°C and humidity between 40% and 90% will he the fabricator make a high quality part. Consistent shop conditions contribute to consistent gel times. AOC’s Altek R830-CEA-21 was formulated to be used with inorganic fillers. Typically, one would use Calcium Carbonate in the 10 to 15% range. amount of “fillers” that would be compatible with their operation. Resins are stable for three months from date of production when stored in the original containers away from sunlight at no more than 21°C. After extended storage, some drift may occur in gel time. During the hot summer months, no more than two months stability at 30°C should be anticipated. See appropriate Material Safety Data Sheet for guidelines. Based on tests at 77°F/25°C and 50% relative humidity. All tests performed on unreinforced cured resin castings. 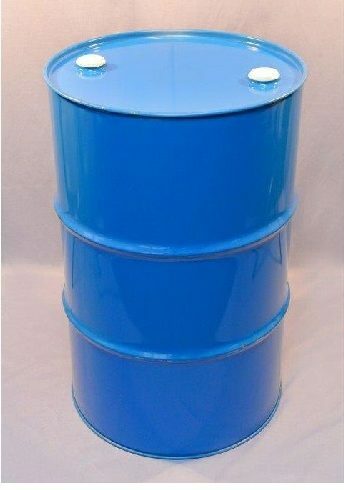 Thixotropic components, if applicable, are excluded from casting samples. Cobalt 6% and post cured. (2) The gel times shown are typical but may be affected by catalyst, promoter and inhibitor concentrations and resin, mold and shop temperature. Variations in gelling characteristics can be expected between different lots of catalysts and at extremely high humidities. Pigment and fillers can retard or accelerate gelation. It is recommended that the fabricator check the gelling characteristics of a small quantity of resin under actual operating conditions prior to use.